Almond benefits in healing a number of ailments such as anemia, osteoporosis, insomnia, skin problems, coughing, nervousness, anxiety, and so on. In addition, it is useful in lowering LDL cholesterol and reducing the risk of developing cardiovascular disease. Plus, munching on raw or roasted almonds serves as a great snack. You can also use almond oil to derive its benefits. Besides, almond butter and almond milk are healthy but tend to be high in calories. Almonds can be added in salads, baked dishes, confectioneries and stir fries too. Scientific Name: Prunus dulcis, Prunus amygdalus Batsch, Amygdalus communis L.
Almonds are native to West Asia, North Africa, and the Mediterranean regions. The nut is primarily produced in USA, Italy, Spain, Australia, Iran, Morocco and Turkey. It belongs to the Rosaceae family. Almonds have thermogenic, sedative, anti-spasmodic, astringent, laxative, diuretic, demulcent and aphrodisiac properties. They are loaded with phytochemicals and antioxidants. These nuts reduce LDL cholesterol, regulate high blood pressure. They help control type 2 Diabetes and are good for your heart when taken in a balanced and nutritious diet. Thus, the health benefits of almonds derived from mono-unsaturated fatty acids help prevent heart disease. The nut also lowers the risk of Alzheimer’s disease. Moreover, almonds are useful in curing obesity by promoting weight loss. Basically, being rich in proteins, fiber and monosaturated fats they help control food cravings. Consuming them in excess, however, may lead to weight gain. The flavonoids present in this nut inhibit the growth of tumor cells, thereby suppressing conditions like prostrate tumor and breast cancer. In addition, almonds contain chemicals like phenylalanine, nutrientriboflavin and L-carnitine that support healthy neurological function and improve memory. The protein found in almond is easy to digest (especially when the nut is soaked in water for about 12 hours to remove the brown skin) and even makes a good supplement for milk because it includes amandin. Besides, almond oil can be consumed or used in aromatherapy and massage. It has a soothing smell and is rich in vitamin A, vitamin B1, vitamin B2, vitamin B6 and vitamin E.
The oil works as a natural moisturizes and nourishes dry and irritated skin. Plus, it adds glow to the skin and stimulates hair growth. It is considered as light carrier oil that easily gets absorbed in the skin. When ingesting the oil, though, make sure it is sweet almond oil not bitter. It can be used in culinary preparations as well. In terms of nutrition, almonds are enriched with riboflavin, niacin, manganese, magnesium, copper, calcium, potassium, phosphorus, etc. Plus, the nut includes omega-6 fatty acids, omega-9 fatty acids and dietary fiber. It is low in sodium and does not contain cholesterol. As almonds are rich in folic acid, they are considered good for pregnant women to avoid serious birth defects. • Taking a combination of one teaspoon almond oil, ten drops of ginger juice and some lemon juice helps provide relief from issues like whooping cough, asthma and bronchitis. • Regularly having about three ounces of almonds in a day helps lower cholesterol level. In case of diabetes, soak a handful of almonds in water overnight, peel off their brown skin and then consume them in the morning on an empty stomach. Almonds also improve concentration. • Gently rubbing a combination of two teaspoons of almond oil and one teaspoon of rose oil on the chest is valuable when dealing with Angina. 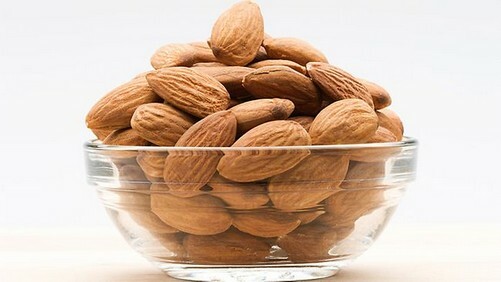 • Soak about 8-10 almonds in water for a couple of hours. Next, remove their skin and grind them to form a paste. Eat this paste daily for about three months to heal Anemia. • Having a glass of milk mixed with a few drops of sweet almond oil helps in getting rid of dry cough caused by heat. 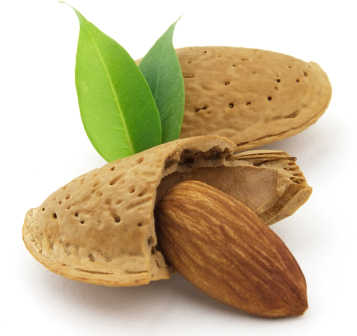 • To treat nervousness and anxiety, soak 10 almonds in water overnight. Next, remove the skin and grind the almonds. Add one teaspoon of nutmeg and a pinch of dry ginger powder in it. Mix this paste in a glass of warm milk and drink it. Besides, you can massage the temples with a solution of almond oil and lavender essential oil. • Soak 8-10 almonds overnight, remove the skin and grind them along with an equal amount of black peppercorns to form a pasty mixture. Add this in a cup of milk and consume it to improve sexual debility. • Mild bleaching benefits of almond are valuable in almond home remedies for beauty care. For instance, combine equal amounts of almond oil and honey and apply it on skin to brighten your complexion. Another natural cure to remove sun tan is to apply a mixture prepared from half teaspoon almond oil, and one teaspoon each of lemon juice, milk powder and honey. You can add some rose petals, too. • Regularly massaging the area under the eyes with almond oil reduces dark circles naturally. Follow this therapy for at least two weeks. • Frequently massaging the scalp with almond oil is good for hair. It prevents hair fall, too. • When dealing with insomnia, prepare a paste by grinding 7-10 blanched almonds and half a teaspoon of khus khus (poppy seeds). Add this mixture in half a cup of milk. Finally, rub this paste on your palms and soles before going to sleep. 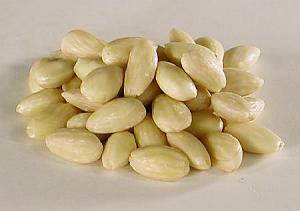 Check out this video showing how to blanch almonds. • Almond benefits in stimulating digestion. For this, you need to consume about two teaspoons of sweet almond oil in a day. It strengthens the immune system as well. Do not follow this treatment for more than a week, though. • Taking half a cup of warm milk mixed with one teaspoon of almond oil relieves indigestion and constipation. • Eating a few raw almonds slowly serves as a simple natural cure for heartburn. Traditionally, almond “bonbonieres” are distributed as wedding favors as these sugared almonds denote romance, happiness, children and good fortune. According to Jews, combination of shelled almonds and raisins serves as a good luck symbol. The nut is also mentioned in several stories from Bible. As already mentioned, excessive consumption of almonds may cause gain in weight. It may cause bloating and constipation as well. Moreover, almond benefits the health in several ways but it is likely to produce heat in the body, especially in hot climatic conditions. Thus, it is suggested to soak the nut in water overnight, remove its brown skin and then consume it. Besides, though rare still, certain individuals may be allergic to almonds. It was fantastic to know about badam but i need to the life of the badam to store?